Mexican women are known for their beauty from ages. Their charismatic beauty and fitness are admired all over the world. They take proper care of their skin and enhance the beauty of their darker skin perfectly. If you are curious to know about their beauty and fitness secrets, here it is! Avocado is widely used in Mexico and is found in almost all foods you eat. They also use avocados for making face masks and hair masks. You can also use avocado as oil or a sunscreen. Avocado helps in losing weight, and also improves your health. It is great for improving the elasticity of the skin as well. Cactus plants are very common in Mexico. During the body massage session, people here put cactus innards all over the body. This is beneficial for healing and cooling their body and also removes toxins from the body. Cactus makes you fresh and rejuvenated, awakening your senses and opening the clogged pores. Mexican beauties believe that dark chocolate can do wonders for your skin. It is rich in iron, vitamins and calcium, which are excellent for keeping your skin healthy and glowing. Face mask made with dark chocolate can detoxify and rejuvenate the skin. Chocolate that contains jojoba oil can help in repairing dry skin and lips. Mix it with brown sugar and scrub your skin and lips with it. This will moisturize the skin and provide you smooth and silky soft skin. Mexicans give special importance to exfoliation of the skin. They always keep coarse sea salt in their bathrooms. Before they take bath, they rub this salt on their entire body to get rid of dead skin cells and other impurities on the skin. Loofah, exfoliating sponges, exfoliating mitts and exfoliating towels are other exfoliating products they use. Brown sugar is also used for exfoliating the skin. It has smaller granules than the sea salt and is gentle on the skin as they are softer in texture. Mexicans mix 1 teaspoon of brown sugar with their face wash or body wash and use it as a scrub to remove dead skin cells. This provides them brighter skin that looks young and beautiful. Mexican ladies wash their hair in jalapeno and tequila. These help in providing them long and beautiful tresses. This is considered as one of the secrets of Mexicans. They soak jalapeno in tequila for a few days. After that they keep the mixture in the sun. They use this mixture twice a month to wash their hair. They apply this mixture about 15 minutes before they wash their hair. This helps in increasing the growth of hair, and keeps their hair healthy as well as long and shiny. Jalapeno helps in increasing the circulation of blood in the scalp and promotes hair growth. Make sure that you wear gloves when you apply it, as jalapeno can be very hot. Also avoid contact with your eyes and face. 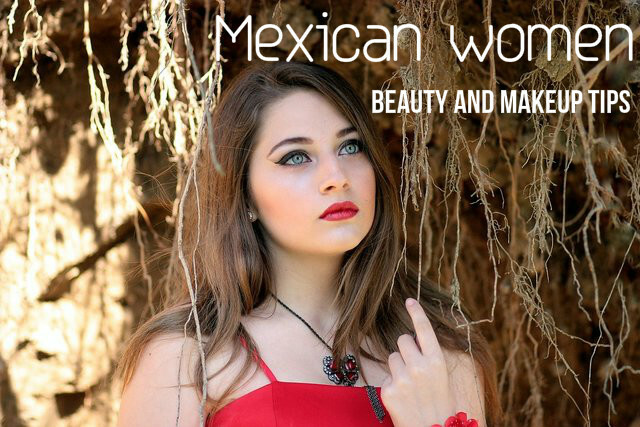 Mexican beauties always prefer light makeup instead of heavy and cakey makeup. They say that heavy makeup can make your skin unhealthy, dull and loose. They always make it a practice to remove their makeup before they go to sleep at night. This allows your skin to breath well. The bark of Tepezcohuite tree has analgesic, regenerative and anti-microbial properties. Mexican ladies use skin creams made with this bark. This cream is very beneficial for treating various skin problems like burns, wrinkles, scars, eczema, acne, stretch marks and psoriasis. You can powder this bark and use it for providing you relief from minor injuries and burns. Having known the makeup and beauty secrets of Mexican women, now let us have some knowledge about their diet and fitness secrets. Beans also have an important place in Mexican cuisine. They are rich sources of fiber and carbohydrates, but low in calories. As a result, they are very healthy for the body. Other foods consumed by Mexicans are green vegetables, tomatoes, salsa, lettuce etc. These foods are very healthy and provide you many of the nutrients needed. Mexicans love eating fish. They include fish rich in omega-3 fatty acids in their regular diet. This helps them to keep a control on their weight. Consuming fish also improves the texture of the skin and keeps it shiny and supple. If they do not eat fish, then they include omega-3 supplements in their diet. This helps in keeping them healthy and fit. Mexican foods are usually high in fat, calories and sodium. Foods like high-fat meat, cheese, tortilla, sour cream, deep-fried combo dishes and so on are rich in fats and calories. So, you must keep a check on the amount of food you consume. For example, cheese is loaded with calcium and protein, but it is also rich in saturated fats. So you should take care to have it only in small portions. Mexicans exercise regularly and take good care to maintain their fitness. The daily exercise that they perform does not require any equipment. They do exercises like lunges, crunches, stretches, yoga and squats every day in the morning. They need not go to a gym for performing these exercises. They can do it at home or anywhere else according to their convenience. The beauty and fitness secrets of Mexican beauties are simple and easy to follow. So, try to include them in your routine too, and enjoy the benefits they give.